The Geological Society of the Oregon Country invites you to its 84th Annual Banquet. Ian Madin, DOGAMI Senior Scientist and Earthquake Hazard Geologist will discuss three recently discovered fault systems: Mt Hood, The White Branch of The McKenzie, and the John Day fault. Registration is now closed. Dr. Michael Cummings, PSU Emeritus Professor of Geology, will discuss implementation of Next Generation Science Standards (NGSS) for students in Oregon. Supporting teachers as they made the shift from the old way of teaching science to the expectations of NGSS has been the focus of professional development since 2015. Dr. Cummings will describe three examples that illustrate working with teachers and districts to implement NGSS. These include: 1) Project based learning in the Mitchell School District, 2) Groundwater studies in Harney basin at Crane Union High School, and 3) Integration and implementation of NGSS in multi-grade classrooms. Photo: Harney Rockers, Crane Union High School Physical Science Class. GSOC field trip leaders will present our "Year in Review" program with brief slideshow summaries of their trips. Our GSOC Annual Holiday Party is scheduled for FRIDAY, December 14, at 614 NE 114th Ave., Portland. GSOC Board Members will provide main dishes with protein of various sorts. Other members please bring vegetable, side dishes or desserts for 6 to share, plus beverage of their choice. Music program to be announced. Please RSVP. Bring a Rock to Help Us Decorate the Audubon Geologic Fireplace at Marmot Cabin! Portland Audubon has been working with GSOC and Poetry in Stone to design a rock veneer for the fireplace at their new Marmot Cabin environmental educational facility which will represent the geological story of Oregon and they are requesting donations of locally representative accent rocks. Do you have any nice rocks collected in Oregon or Washington that you’d like to donate? Bring them to the potluck and meet our friends from Audubon! 7:15 pm: Welcome presentation. Nominations for GSOC Board members for the 2019-2020 year will be open. 7:30 pm: Dessert and musical program. A slide show of the field trips will be displayed during the meal and afterwards. Oregon’s premier paleontology, Dr. Bill Orr will speak on the topic of "Extinctions." Although we perceive them as catastrophes, mass extinctions are one of the most powerful tools geologists employ as time markers. The presentation will address the major phanerozoic extinctions was well as their probable causes. Included will be a summary of the ever changing cause and effect of the Cretaceous/Tertiary event. The Bonneville Flood was one of the largest floods on Earth. The cataclysmic flood-from the rapid 115 meter drop of Lake Bonneville from the Bonneville level to the Provo level-was nearly 200 meters deep in places and flowed at a maximum rate of about 1 million cubic meters per second — about 100 times greater than any historical Snake River flood. Jim O’Connor has worked at the U.S. Geological Survey since 1991, intent on improving understanding of the processes and events that shape the remarkable and diverse landscapes of the Pacific Northwest. Bill Burgel will speak on the topic of Earthquake Early Warning Systems. His presentation will focus on efforts to provide extremely quick and accurate information of a seismic event especially Magnitude 5.0 and higher to businesses and communities so that they can react to minimize the extent of earthquake damage and/or loss of life. Bill spent 48 years in Railroad Industry after receiving his MS in Structural Geology from Idaho State University and his BS in Engineering from the University of Michigan, with a minor in Geologic Oceanography. Emily Cahoon's talk will focus on volcanic deposits around the John Day Valley and further south to Burns, Oregon. This includes the Clarno Formation, John Day Formation, and lots of mid-Miocene lavas and tuffs. Also, there are unstudied Oligocene to mid-Miocene basaltic lavas and dikes exposed south and east of known PGB localities. These help to reevaluate Picture Gorge Basalt (PGB) distribution and to better understand evolution, mantle components, and possible petrogenetic connections among PGB, Steens Basalt, and the Strawberry Volcanics. Broadly, we will explore the proposed connections between the John Day Formation, the Columbia River Basalts, and the Yellowstone plume. Evaluating the Influence of Cascadia Subduction and the High Lava Plains on Magmatism at a Geologic Crossroads in Central Oregon. Our speaker Dr. Jeffrey Templeton is a Professor of Geology at Western Oregon University, where his research interests include igneous petrology, volcanology, and undergraduate geoscience education. Paleomagnetists — scientists who track the motions of continents from ancient magnetic field directions frozen into rocks — have long known that Oregon has been slowly rotating clockwise over geologic time. Today, GPS documents that the entire Pacific Northwest is rotating clockwise at a little less than 1 degree per million years, causing the Coast Range to move northward and push against slow-moving Canada. The northward push is responsible for crustal earthquakes on shallow faults in the Northwest urban corridor. Dr. Ray Wells has been a research geologist with the USGS for 40 years, where he used field geology, paleomagnetism, and GPS to understand the tectonic evolution and seismic hazards of active continental margins. Recent lidar mapping of large landslides in the western Columbia Gorge in Skamania County, WA, shows that there are many more landslides than previously thought. The mapping area contains at least 215 discrete landslides of various ages — ranging from more than 15,000 years old to currently active. Tom Pierson is a senior research scientist at the USGS Cascades Volcano Observatory in Vancouver, Washington, where his investigations focus mainly on volcano hazards involving lahars (mudflows), floods, and landslides — processes occurring both during and following volcanic eruptions. Sorry registration is now closed. The Geological Society of the Oregon Country invites you to its 83rd Annual Banquet. Speaker Ellen Morris Bishop will present “Mountains out of Molehills: A Brief History of The Wallowas.” The banquet will be held March 11, 2018, at Ernesto’s Italian Restaurant. Doors to the banquet room open at 1:00 p.m. Buffet Luncheon at 1:30 p.m. Program will begin at 2:45 p.m. The Johnson Creek Watershed contains volcanoes, Missoula flood deposits, and the oldest rocks in the East Portland Metro. Though this dramatic geologic history is usually obscured by vegetation and development, the creek cuts a slice down through the geologic layer cake to reveal the rock formations underlying Gresham, Southeast Portland, and Milwaukie. Paul Edison-Lahm will lead this virtual tour of the Watershed and give tips for exploring Portland's Eastside. GSOC field trip leaders will present our "Year in Review" program with brief slide show summaries of their trips. GSOC Annual Holiday Party is scheduled for SATURDAY, December 16, at 614 NE 114th Ave., Portland. GSOC Board Members will provide main dishes with protein of various sorts. Other members please bring vegetable, side dishes or desserts for 6 to share, plus beverage of their choice. Music program to be announced. There will be no December Friday night meeting due to the Holiday Party. Friday Night Lecture — Leslie Moclock, "Oregon’s Gems: The Geologic Stories Behind Beautiful Stones"
Oregon’s volcanic history has given us more than mountains. Come learn how sunstones and opals feature in our state’s geologic past. Leslie Moclock has been the curator at the Rice Northwest Museum of Rocks and Minerals since 2014. She holds a MS in Geology from University of California-Davis and a BA from Amherst College. The Middle Columbia Basin of north-central Oregon lies across the axis of the High Cascades volcanic arc, stretching from Cascade Locks east to Biggs and southward from the Columbia River to Tygh Valley. Ongoing Geologic mapping in the basin by the Oregon Department of Geology and Mineral Industries is providing new insight into the middle Miocene to present volcanic and structural development of the region. Jason McClaughry, DOGAMI Eastern Oregon Regional Geologist, will summarize local Columbia River Basalt Group stratigraphy, discuss new geochemical data and geochronologic constraints on late Miocene to Pleistocene Early to Late High Cascades Volcanic Rocks, and characterize the major structural trends in the region. The Johnson Creek Watershed contains volcanoes, Missoula flood deposits, and the oldest rocks in the Portland Metro. Though this dramatic geologic history is usually obscured by vegetation and development, the creek cuts a slice down through the geologic layer cake to reveal the rock formations underlying Gresham, Southeast Portland, and Milwaukie. Grab a pint at the Eagle Eye Tavern and find out more at this science talk, by the GSOC's own Paul Edison-Lahm. This is a Johnson Creek Watershed Council event. Register here. Frank Hladky, Oregon Registered Geologist and Geology Instructor will discuss Getting the Science Right: Teaching and Doing Geology in Southern Oregon. Teaching geology to youth requires clarifying the philosophy of rational thought. Geology, like other sciences, relies on evidence to substantiate interpretations. Utilizing vignettes from geological field studies in southern Oregon, Mr. Hladky shows how multiple lines of evidence leads to an understanding of the natural world with greater clarity. At the end of the Ice Age when the Lake Missoula Flood roared across the landscape, the floodwaters carried with it granite and other boulders. These rocks, referred to as erratics, were encased in the floating sections of the broken ice dam and distributed along the path of the mighty waters from Montana to the Pacific Ocean. Rick Thompson of the Ice Age Floods Institute will tell about the ongoing hunt for these iceberg erratics in the Portland/Willamette Valley area, explain how to recognize an erratic, and discuss ice age floods around the world. Thomas Condon, Frontier Missionary and Oregon’s First State Geologist, came to the Oregon Territory in 1852 and soon became interested in its remarkable fossil assemblage. Condon's personal collection of Oregon plant and animal fossils reflect not only his science but his travels and associates as well. Dr. Orr will examine these aspects of his life as well as the nature of his work and achievements. The High Lava Plains is an enigmatic province between the hot-spot related Steens Basalts and the subduction-related Cascades. Dr. Grunder will explore the implications of the westward age progression of rhyolites and the effect of protracted magmatism on the composition of the volcanic rocks and the crust. Social hour before the lecture: join us at 6:00 p.m. at Pizzicato, 1708 SW 6th Avenue for delicious pizza and salads and beverages. The Geological Society of the Oregon Country invites you to its 82nd Annual Banquet. 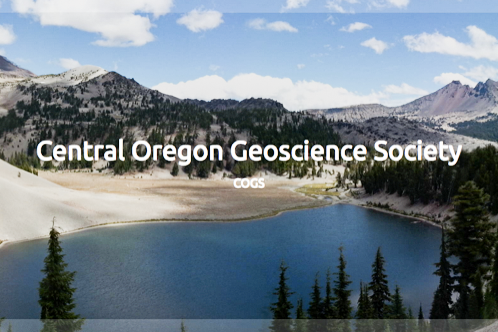 GSOC President Bo Nonn will present “Cascade Geology From the Top Down: Features You Won't See From the Road.” The banquet will be held March 12, 2017, at Ernesto’s Italian Restaurant. Doors to the banquet room open at 1:00 p.m. Dinner at 1:30 p.m. Program will begin at 2:15 p.m.
Regretfully we have had to cancel Mr. Palani's talk due to snow and will be rescheduling. GSOC Members and their guests are invited to the 8th GSOC Annual Holiday Party and field trip slideshow. Friday Night Lecture — Salvage Paleontology: Fossil Rescue at Construction Sites. Fossils are protected resources at ground-disturbing construction sites on public lands in the United States. A matrix of federal, state, and county laws require the retrieval of fossil objects that might be used for display, research or teaching. Sheila Alfsen will speak on her experiences in salvage paleontology industry, working in the states of the western United States. Friday Night Lecture May 13th: Dr. Bill Orr — Lagerstätten! A Lagerstätte (German from Lager 'storage, lair', Stätte 'place'; plural Lagerstätten) is a sedimentary deposit that exhibits extraordinary fossils with exceptional preservation—sometimes including preserved soft tissues. These formations may have resulted from carcass burial in an anoxic environment with minimal bacteria, thus delaying decomposition. Image: middle Cambrian Ottoia, a soft-bodied worm, from the Burgess Shale; Credit: Martin R. Smith. Come see billion-year-old building stones and the fossils hidden under our feet. Join us for a two-hour outdoor walking tour of downtown Portland’s geological mysteries and oddities. This tour is open to the public. This trip will focus on the geology and hydrology of the Johnson Creek Watershed. This will be an approximately 6 hour van tour led by Melanie Klym and Matthew Brunengo. Thanks to GeoEngineers for their generous sponsorship of this event. New start/end location: front of MILWAUKIE CITY HALL, 10722 SE Main St. This field trip, organized by GSOC President Paul Edison-Lahm, will focus on the geology of Camp Hancock and the John Day basin. We will be attending an Astronomy Star Party as guests of the Rose City Astronomers and OMSI. This event is sold out. Once again this year, Sheila Alfsen will host a tour by helicopter of Mt. St. Helens and the surrounding devastation area on Aug. 18, 2018. The price includes a presentation in the gift shop theater of the 1980 eruption and its aftermath, and a 40 minute flight over the devastated area and close up to the crater where you can see the effects on the landscape. Additionally Nathan Reynolds, Ethno-ecologist and Habitat Program Manager for the Cowlitz Indian Tribe, will be giving a presentation about the federal designation of Lawetlat’la/Mt. St. Helens as a Traditional Cultural Property of the Cowlitz Tribe and Yakima Nation. This event is sold out. Join us at the Rice Northwest Museum of Rocks and Minerals for our annual potluck picnic, Sunday, August 12 at noon. Your $10 will go both to your day's museum admission and to your annual membership to the Rice Museum as a GSOC member. This year will be a great time to take advantage of this offer and treat yourself to a tour of this highly esteemed Pacific Northwest treasure. Our speaker this year is Dr. Nick Famoso, John Day Fossil Beds National Monument Chief of Paleontology & Museum Curator, who will discuss the world-class John Day Fossil Beds. Nick's work has focused on the recovery of mammalian eco-systems after volcanic eruptions such as Mt. St. Helens and the Picture Gorge ignimbrite. Picnic is potluck style, so board members will bring a main protein-based dish and general members may bring any type of side dish, dessert, or beverage (no alcohol). The Rice Museum is at 26385 NW Groveland Drive, Hillsboro, OR. Hope to see you there! With cooler weather forecast for Saturday, ride with us along the Eastbank from the Portland's youngest rocks to its oldest. We will dine after at the Milwaukie Station Food Carts and Beer Garden. No geologic knowledge required. This is a 3-hour moderately-paced bike ride (9 miles) with a return by MAX. (A shorter 5 mile route, with return by MAX, is also available.) We will be starting from "Peace Sign Park" at NE Oregon and Interstate. Sign-ups are now full. If you have already signed-up for this field trip with Dave Olcott, use the registration page to complete your registration and pay your registration fee. If you'd like to be on the alternate list, please email Dave. We can't get enough of exploring Downtown Portland Building Stone! If you missed our Spring tour or just want to see more interesting buildings, join us for this two-hour walking tour of more of downtown Portland's geological mysteries and oddities. This tour is open to public. We will be meeting at Pioneer Courthouse Square, across from the 6th Avenue Pioneer Courthouse entrance. The Geological Society of the Oregon Country will host a one-day helicopter field trip of Mt. St. Helens. The helicopter tour is approximately 40 minutes of spectacular scenery as you fly over both the devastated area from the 1980 eruption and the crater itself. An educational presentation by Sheila Alfsen will precede your tour so that you can recognize and interpret the landscape in light of the greatest volcanic event in recorded U.S. history. This trip limited to GSOC members and their guests only. Become a member today! Registration now open. Limited to GSOC members and their guests only. This field trip, organized by GSOC President Rik Smoody, will focus on the geology of the Cascades and will climax in the total eclipse of the sun on the morning of August 21. It will be held at a private property in Mill City, Oregon, and will be limited to 48 GSOC members and their guests and 12 vehicles. Cost $80 per person. This year’s GSOC picnic will be held at the farm belonging to GSOC Past President Janet Rasmussen and her husband Doug Rasmussen. It is open to GSOC members only. It will be held at 5401 NE Riverside Drive, McMinnville, Oregon. If you are coming, bring $5 a head to offset production costs, your favorite picnic chair, your favorite beverage and a side dish or dessert. Janet will be providing hamburgers and veg hamburgers, buns and condiments. Games will include croquet and billiards. Become a GSOC member today! Because of the high temperatures forecast for Saturday, the starting time for this tour has been pushed up to 9:00 a.m. We will fully refund your fee if you have already registered and the new time doesn't work for you. Sorry for the inconvenience. Email Paul with questions or cancellations. Join us for a one day field trip to study Missoula Floods gravel and cobble deposits, and Boring volcanism in Clark County on Saturday, June 17, 2017. Tour will be given by Bill Montgomery, CEMEX Executive, and GSOC Past Presidents Bo Nonn and Larry Purchase. The Geological Society of the Oregon Country will host a one-day helicopter field trip of Mt. St. Helens. We will be based at Hoffstadt Bluffs Visitor Center on the North Fork of the Toutle River. The helicopter tour is approximately 40 minutes of spectacular scenery as you fly over both the devastated area from the 1980 eruption and the crater itself. An educational presentation by Sheila Alfsen will precede your tour so that you can recognize and interpret the landscape in light of the greatest volcanic event in recorded U.S. history. The deadline for your payment is Thursday, Sept 29th, 2016. Click for tour and payment information. Registration now closed. Stay tuned for our report on the trip! Our four-day excursion will travel down the coast to Brookings and across to Grants Pass before returning via I-5. The emphasis will be on the complex geology of the Mesozoic accreted terranes of the Klamaths but on the way we will take a look at Tertiary terranes of the north coast and interactions of Columbia River Basalt flows with coastal sediments. This year’s annual picnic will be held at Tualatin Community Park, 8515 SW Tualatin Rd, Tualatin, OR. At this year’s annual picnic, we have reserved the north side of the main picnic shelter, which also has rest rooms, from 11:00 am to 3:00 pm. Electricity is provided, and alcohol is permitted. The shelter will accommodate about 75 people. A two day field trip under the guidance of an all-star cast of geologists that not only know the story but can enthusiastically tell the geologic story of this dynamic area. Tour Portland Geology with Us by Public Transportation. A short survey of some of Portland's geologic features that reveal its past and structure. This is a great tour for those new to geology or Portland or both. Registration open now! Trip requires TriMet day pass. President Janet Rasmussen will lead a field trip to the Steens Mountain area of Southeast Oregon. Learn the dramatic story of the great flood basalts of the Columbia River Gorge which form its spectacular walls and waterfalls. Join us for our annual potluck picnic, Sunday, August 2nd, 2015 at 12:00 noon at Guy Talbot State Park in the Columbia Gorge (same location as last year). Learn the dramatic story of the surrounding Columbia River Gorge and the great flood basalts which form its spectacular walls and waterfalls. After the picnic, participants may wish to take the short walk to Latourell Falls, or drive to the trailhead near the freeway exit and hike up to Angel's Rest. Q through Z - bring a dessert. Remember: Board Meeting starts at 10:00 a.m. for board members, officers, and interested members. Board Meeting Agenda is here. Past President Larry Purchase and current Vice President Bo Nonn will lead a two-day field trip to the north side of Mt. Hood. From our camp at Cloud Cap Saddle Campground we will climb onto the nearby Cooper Spur moraine to view the terminus of Eliot glacier and discuss the morphology of the Hood’s largest glacier and its periglacial features. Farther downslope we will examine the site of a major debris flow which passed down Eliot Creek in 2006. Nearby is the upper end of the 9km long Parkdale lava flow, a basaltic lava flow less than 8,000 years old. If possible we will examine the more accessible portions of the lava flow including the vent area. Interested in being a tour guide for our upcoming PDX Downtown Geology Tour? We are doing a pre-run/organizational meeting for the tour Wednesday, April 8th, 9:00 a.m at the Pioneer Place Mall Fountain (the one with the black limestone bollard caps with crinoid stars). Come if you're interested in helping or just curious to watch geologists with hand lenses crawling around Portland's most distinguished buildings. RSVP to Paul Edison-Lahm.